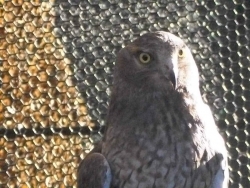 November 17, 2010 (Alpine)—Far off the beaten path in the back country of east San Diego County, nestled in a hidden glen, is a special rehabilitation center for injured and orphaned birds of prey. 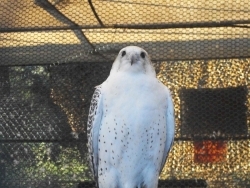 Sky Hunters is a raptor education facility geared toward public information, preservation and rehabilitation of birds of prey. 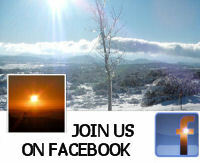 Scroll down for details and to view our video. Presentations are given to people of all ages with live educational birds of prey. Some of the birds you will see are red-tailed hawks, barn owls, American kestrels, a bald eagle and a golden eagle, falcons, buzzards, and crows. My grandsons and I found our visit to be pleasant and enjoyable. John Conney, the keeper, was skilled in demonstrating how to handle a raptor ( in this case, a red-tailed hawk ). Nancy Conney, the director, was very knowledgeable and has a deep love for what she does, also making you feel right at home. I would definitely recommend visiting this facility and seeing the Sky Hunters up close to learn about raptor behaviors, as well as what to do if you find a sick injured or orphaned raptor. 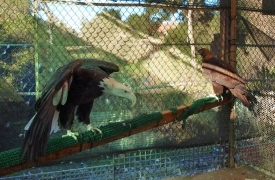 Sky Hunters Raptor Education & Rehabilitation Center is located in Alpine. It’s just 45 minute drive from San Diego and well worth the trip. For more info call 619-445-6565 or go to: http://www.skyhunters.org/home.html. For emergencies, page 619-580-HAWK.